By 2050, as many as 16 million people could be affected by Alzheimer's disease. Silver BookBy 2050, as many as 16 million people could be affected by Alzheimer’s disease. 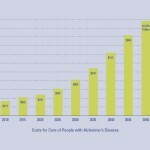 By 2050, as many as 16 million people could be affected by Alzheimer’s disease.